An 1856 print in the Asylum's Annual Report depicts gleeful and well-dressed children rolling hoops, playing tag and ring-around-the-rosy. In truth things were a bit harsher. (copyright expired). Like Dickens’ London, the back streets of Victorian New York City teemed with impoverished children who eked their existence through crime. Commonly called “street arabs,” bands of the often-filthy urchins were a major problem. 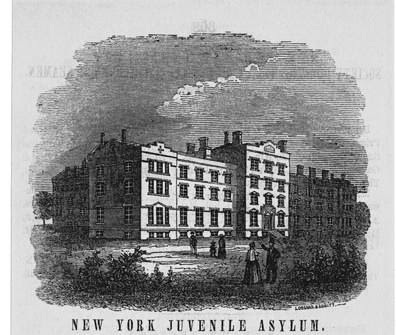 To deal with the situation the Juvenile Asylum was incorporated in 1851. 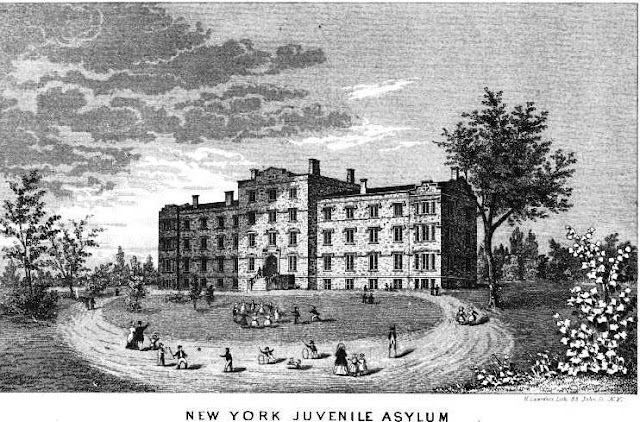 Not an orphanage—most of these children had parents—it was a place where children who were arrested or otherwise removed from the streets were “cared for, instructed and trained, both morally and intellectually, until indentured or otherwise disposed of according to their discretion and the intent of the law,” according to the Annual Report. An impressive Gothic-inspired building was opened on April 2, 1856 to replace the original structure which Asylum directors called “dreary, comfortless, inconvenient and insecure as can well be imagined.” Located at 175th between 10th and 11th Avenues, it offered open space and fresh air to the urban children. The youths who were removed from the streets did not come here directly. They were required to spend ten days at the House of Reception on West 13th Street. “Within these ten days, the parents or guardians, if to be found, are to be notified of the arrest of the child, and that they may appear and show cause for his discharge. Failing to do this, the law deprives them of all custody of the child, and transfers their rights to this Corporation, who thenceforth stand to him in loco parentis,” as recorded in the Charter. The children who arrived at the House of Reception were immediately taken to the bathing room where all their clothes were removed and if “as frequently found to be the case, they are either worthless as garments, or are infested with vermin, they are burned or otherwise disposed of.” The children were then bathed, inspected by a doctor, given a new suit of clothes “suited to the season of the year,” and given a meal. Not all the inmates arrived here as a result of arrest. Their parents often brought them to the House of Reception simply out of the frustration of not being able to control their children. From the moment they entered the House of Reception, they knew they had lost control of their young lives. But turning street toughs into respectable citizens was not an easy matter. The boys had learned to survive through brute force and guile and those instincts hung on. Late at night on October 2, 1860, for instance, Officer Leary heard “the cry of murder” coming from the House of Reception. When he arrived in one of the upstairs rooms, he found Robert Winn bleeding from wounds in his side and forehead. Winn identified his roommate, William Rigby, as having stabbed him. The policeman ran into the street and found Rigby. He explained that Winn had been taking up more than his fair share of the bed and refused to move over when asked to do so. Stabbing his roommate, apparently, seemed a logical method of solving the conflict to young Rigby. Once committed to the Asylum, the lives of the children would change drastically. The goal of the institution was not to educate nor reform. The goal was to get rid of them. And to accomplish this the children, mainly the boys, were indentured. “But when the seed is sown, we relinquish the cultivation to others,” said the Report. Therefore children were supplied to families, often in the West, who needed extra manpower in running a farm or other business. “Several companies of children are sent annually to the Western States, to be indentured to farmers and others, under the direction of a judicious person. Children are also bound out in the city and vicinity as occasion offers,” reported the Gazetteer of the State of New York in 1860. In these years before the Civil War, the indenturing of children smacked of slavery. The New York Journal of Commerce in 1858 reported that “a selection of boys and girls, chosen from a larger lot of 400,” were to be “examined and sold at the House of Reception, No. 23 West 13th Street.” The article promised a bill of sale after cash was paid. 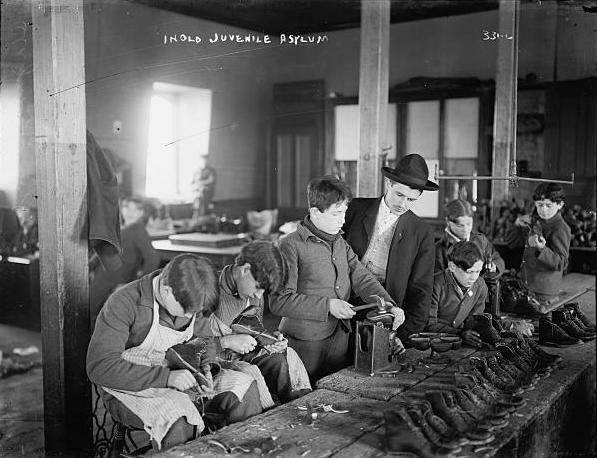 Young boys learn to make shoes in the late 19th century. Note the shadeless gas jet hanging over the table. photo Library of Congress. 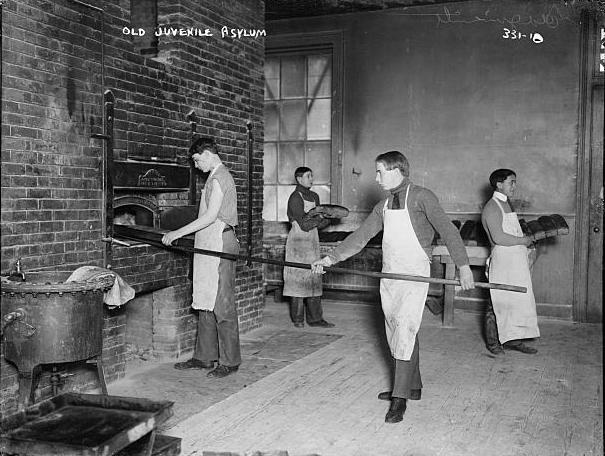 Morning and evening meals consisted of bread, baked by inmates, and milk --photo Library of Congress. The Juvenile Asylum was determined to make these girls model citizens and wives. “They are drilled into thoroughness in all that they undertake; and, instead of growing up to be drones and beggars, fitted for a career of degrading vice and for an early grave, they now bid fair to be industrious, useful, and virtuous members of society.” The girls were taught to “read, right and cipher,” as well as to sew. The girls’ needlework was exhibited and sold at a fair in the Fall. In 1901 there were about 1,200 children in the old asylum building and a 275-acre tract of land was purchased in upstate New York. Before long a new facility had been built and the brooding Gothic asylum structure was razed. Its demolition ended a dark, Dickensonian period of which most New Yorkers are totally unaware. Great insights,Thanks for the share.Knowing stories of historic buildings and statues give you an edge to share more things fro those who are willing to listen.